Kage Baker had a life-long obsession with an architectural oddity that she called The Sentinel. It was visible from the backyard, a bit of weirdness on a nearby hillside – the degree of visibility depended on how high the mustard and wild oats and fennel were growing that year, and whether or not a tree had recently fallen down or grown up. When we were little, she would sometimes pause in the engrossing business of the backyard chaos to creep off to the edge. She’d stand there, her arm round a eucalyptus tree, and stare out over the canyons at what could be seen of the Sentinal – a fraction of white wall and a hint of coloured tile, and a shape that suggested a flat-topped pyramid.There was enough eccentric stonework in our own neighborhood – hell, in our own yard, thanks to Momma’s occasional sculpting fits – that the idea of a Mayan temple two hillridges away was not impossible. Kage burned to get over there and explore it. We knew there were weird houses up there – the things we passed when Momma was simply driving to and from the store were rich with gargoyles, tiles, jury-rigged crenelations and other architectural follies. What was so fascinating about The Sentinel was that we never seemed to pass it on the streets. Kage could see how to get there overland (sort of; by following her habitual technique of straight-line trespassery) but she couldn’t figure out how to get there on the streets. At that early age, we were not yet allowed to go romping around the hills. And Momma was not inclined to go driving around in search of Kage’s whims – as I would become when I learned to drive. So for literally years and years, all Kage knew about that distant thing was that it looked like one side of a pyramid; it was black and blue and white, like a magpie; it was covered in tiles. And, once she old enough to “borrow” Dad’s binoculars, that it was decorated with an enormous Spider in a web. You can imagine how this fascinated Kage. It nearly drove her crazy. By 7 or 8th grade, though, we were exploring the hills with no hindrence. The youngest, Genny, was born when Kage was 14 – Momma was very busily involved with either Genny or studio work (landscapes and Christmas cards, mostly) or both: any of us who could take care of ourselves for 8 hours at a time were encouraged to do so. Momma could work with the baby in her basket under an easel; the rest of us prowling around nagging for pocket money and rides places drove her mad. So, as long as we came home for dinner, we had no real hindrance to wandering through the Hollywood Hills. It was during that early phase that Kage actually found her way to the site of The Sentinel. 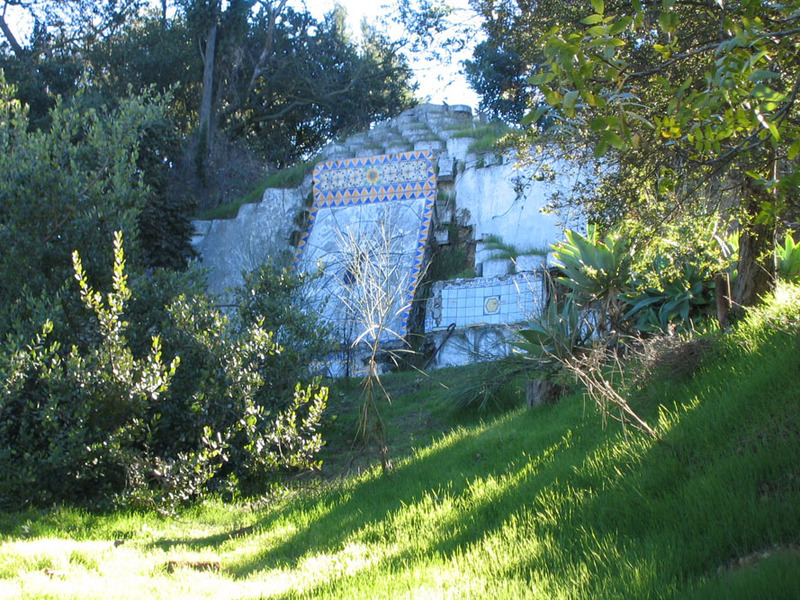 What she found was the high, weird wall itself – not one side of a pyramid at all, but a sloping front above the remains of a pool, built up against the hillside. The rolling ground all around it hinted at ruins and the remains of buildings, but The Sentinel itself stood almost alone by then in a green dell in the hills. There were modern houses all around, almost closing it off – Kage got there by clambering down the hillside from an unpaved road. She took a chunk of tile and concrete, fallen from the lower hem of the mosaic Spider – I still have it. We tried to get back during high school, but she could never find the way again. The houses grew up tall and new all around it, and we could no longer locate a path. Even if we had simply climbed up through the wild oats and poison oak, we’d have found our passage blocked by inhabited buildings – the place had become a sequestered hollow, unused and hidden by the back walls of the houses around it. But Kage never stopped being fascinated by it. That’s h0w I know that the all the paths disappeared, and that exploring only got you trapped under very suspicious people’s houses and back decks … we tried that, and that’s what we found.The Sentinel was hidden in a cup of hillsides and back walls, lost under the trees in a forgotten garden. And then we left Los Angeles, and journeyed hither and yon over the landscapes of California. Kage explored the ruins of Sutro’s Pools and his statuary garden in San Francisco; she climbed the trails in Silverado to find the ruins where Robert Louis Stephenson spent his honeymoon; she found Drake’s Bay and got to handle the looted Chinese porcelain those Elizabethan pirates left behind. But she never forgot The Sentinel, that strange place up the hill. When we finally settled in Pismo Beach, she began researching it through the all-seeing eye of the Internet. And a fe years before she died, she found it, and the people – just as intense as she was – who had also found it by accident and been exploring it. They had learned a lot, and they were willing to share. These posts make me miss Kage and wish I’d had more of an opportunity to get to know her. This is an awesome story! I’m on tenterhooks!